Chuckanut Bay Foods is a family-owned and locally-operated boutique bakery that grew out of what was originally Chuckanut Cheesecake, the home of renowned gourmet cheesecakes since 1992. They hold to a philosophy of producing unparalleled flavor and uncompromising quality in made-from-scratch cheesecakes and other desserts. Inspired by the magnificent beauty of the Chuckanut Bay region, their desserts feature fresh, natural ingredients from surrounding farms and dairies as well as throughout the fertile Northwest region. At Chuckanut Bay Foods in Ferndale, a skilled team of bakers creates each gourmet cheesecake with TLC and detailed attention to stringent quality controls. Visit Chuckanut Bay for more delicous details. 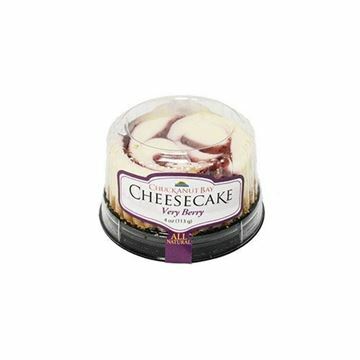 Single-serving of gourmet cheesecake made with the finest Northwest-grown berries.